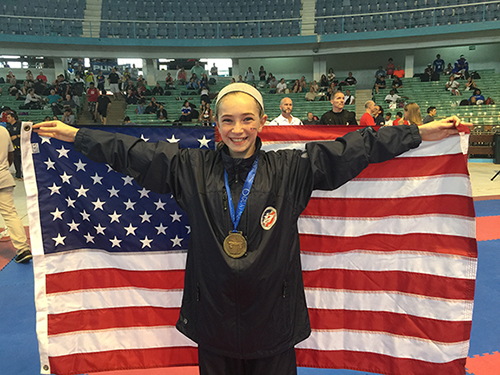 12 Year old Victoria Princi, a MassDojo student from Westford, Massachusetts packs a punch at the United States National Karate Championship in Pittsburgh PA – July 2016 winning the gold and making the US Team. Victoria was always an active kid and started Karate at the tender age of 6. She made her way quickly up the ranks due to her natural Karate talent. Since then she has won numerous team and individual medals including taking the National Championships for her division in 2012, 2013, and 2014. Watching her compete against much taller and bigger girls in her group is like watching David and Goliath spar. She stood her ground and continued to win round after round of tough competition until she ultimately won GOLD and became a national champion multiple times over. “I’m not surprised my students do so well, they work hard, and they have the drive to win but more importantly they know how to handle losing too. Victoria gets knocked down a lot, but she always comes back. There is a saying in martial arts: Get knocked down seven times, get up eight. That is what Victoria is all about”. Victoria was one of 30 members of her team from Massachusetts that went to compete at the USAKNF Nationals Tournament in Pittsburgh. Massdojo came home with an impressive medal count including 13 Gold, 9 Silver and 22 Bronze. This year, Victoria along with 4 students were selected to compete in the Elite Division. Rossini has been teaching karate for more than 20 years and sees promising talent in a lot of his students. Victoria did not disappoint. She won in an exciting match, 5 – 0 in the 2 minute Kumite finals earning her a spot on the US Team and a chance to compete at the Panamerican Karate Federation Championships in Ecuador in August 2016. Victoria fought 3 exhausting rounds to secure a Bronze Medal in the 12-13 Female Elite Kumite -35kg division. Karate’s future has never looked brighter. In 2016 the Olympic committee unanimously approved the decision to have Shotokan Karate in the 2020 Games to be held in Toyko, Japan. The Olympic competition will include approximately 80 Male and Female athletes competing in Kata and Kumite from around the globe.